Happy birthday Helen Griffith (Grandaddy and Janetta Together). It’s the birth date of Juliette Gordon Low (1860–1927) founder of the Girl Scouts of America. Practice your tricks and read about magicians and illusionists on National Magic Day, created in honor of the great Harry Houdini who died on this day in 1926. Read Escape! The Story of the Great Houdini by Sid Fleischman. It’s UNICEF Day, a tradition started in 1950 to raise money for medicine, clean water, food, education, and emergency relief to children in over 150 countries. UNICEF stands for United Nations International Children’s Emergency Fund. Unless you are living under a rock, you know today is Halloween. Either for nutritional or theological reasons, Halloween has not been as appreciated in recent years as when I was a child. But I think there is a better holiday to celebrate on October 31. In fact, I am sorry that it is not a national holiday. For today is the birthday of one of our most brilliant writers for young children, Katherine Paterson. Born in China in 1932 to missionary parents, Katherine moved frequently in her early years and eventually became a missionary herself in Japan. This unique background provided the subject matter for her first children’s book, The Sign of the Chrysanthemum, published in 1973. By 1975 Katherine had won the National Book Award for The Master Puppeteer, and in 1977 she won the Newbery Award for Bridge to Terabithia. Not bad for her first few years as a fledgling children’s book writer! 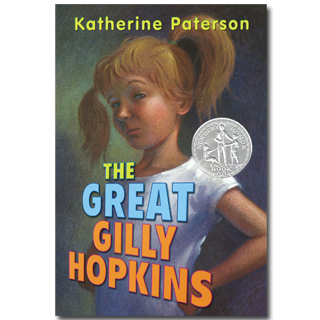 In 1978 The Great Gilly Hopkins appeared, containing one of the most original characters in children’s books. A brash, tough foster child, eleven-year-old Gilly hates going from one foster home to another and does not want to live with the Trotter family. All she really wants to do is live with her birth mother, Courtney. But during the course of the novel, Gilly changes in a believable way. She begins to realize that the Trotters love her — and that her own mother does not. Over the next thirty years, Katherine continued to grow as writer, making each book distinct and individual. She won a second Newbery Award in 1981 for Jacob Have I Loved, but even more significantly she brought quality, consistency, and emotional intensity to everything she wrote. Clearly one of the most significant children’s book writers of the twentieth century, she continues to craft quality books that change the way her readers look at their world. All this has been only part of her contribution. An ambassador for children’s books long before she was selected as the second National Ambassador for Children’s Books, Katherine has received the Hans Christian Anderson Award for the body of her work, and traveled throughout the country and the world on behalf of books for children. She speaks out against censorship; she and her husband, John, support more children’s book projects and events than can be catalogued. And she does all of this with unfailing grace and style. So happy birthday to one of our great class acts in children’s books. On behalf of all your legions of fans, we are so glad that almost four decades ago you decided to write for children. Thank you. We love you for who you are—and for the stories you have given us. That cans it, thought Gilly. At least nobody had accused Mr. or Mrs. Nevins, her most recent foster parents, of being “nice.” Mrs. Richmond, the one with the bad nerves, had been “nice.” The Newman family, who couldn’t keep a five-year-old who wet her bed, had ben “nice.” Well, I’m eleven now, folks, and in case you haven’t heard, I don’t wet my bed anymore. But I am not nice. I am brilliant. I am famous accross this entire country. Nobody wants to tangle with the great Galadriel Hopkins. I am too clever and too hard to manage. Gruesome Gilly, they call me. Also recommended: Bread and Roses, Too by Katherine Paterson Lyddie by Katherine Paterson Any book by Katherine Paterson! Originally posted October 31, 2012. Updated for . I love Halloween. Always have, always will. And Gilly reminds me of a small boy I know a great deal about. And he was such a great kid, and now he’s grown. Grin..
Katherine Paterson is one of my all time favorite authors. Her writings move and touch the reader in a myriad of ways. Check this book out: The Same Stuff as Stars. A truly great book by a truly wonderful author!